The SMP quota system is powerful and easy to use. 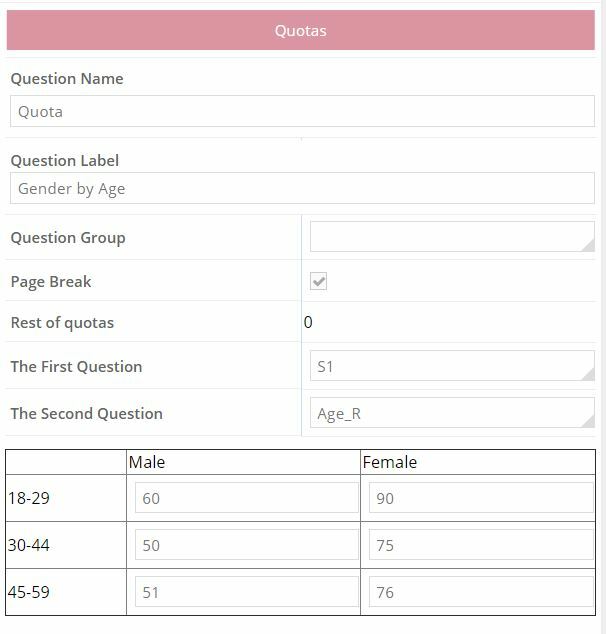 Add your quotas by inserting a quota question types at the points you wish to apply a quota. You can insert as many quotas as you need or combine them with the Compute question type to create as complex a quota as you need. Quotas can also be changed after the survey is launched in the monitor screen. Being able to place quota questions where you like means that you have control over when they are enacted. You can collect all the data you need then apply the quota so you can analyse certain sample criteria such as incidence or drop out reasons. The example below shows two quotas (in the red boxes) placed in different places. The first quotas on gender and age and the second on whether they have children or not. The first quota is based on two variables that are nested together by simply completing the grid in the quota question parameters. One of the variables used in this quota is a recode of the age question. The system will now collect exactly the surveys that match the above criteria in the numbers entered into the grid. You can use a recode control to calculate complex multi-dimensional new hidden questions based on many questions and then use that new question in a quota control. If you need to you can use the monitor feature to alter the quotas as the survey as being conducted. 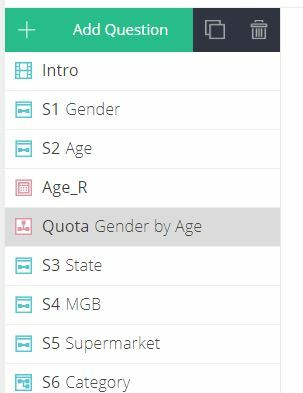 If for example you decide you want more younger people you would simply open the survey monitor, click on “Quotas Config” button and alter your quota numbers in the popup.